The various types of I/P transducers we offer can be used in manufacturing using manifolds with using the transducers in-line, as stand-alone units with small footprints for use in OEM markets and process applications, and explosion-proof units for use in petrochemical and heavy-industrial manufacturing. We also offers I/P transucers with digital input and outputs. The I/P (current to pressure) transducers have a very simple operation. 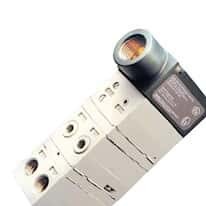 As current or voltage changes, a proportional pneumatic signal changes a membrane within the I/P transducer and allows more or less air or gas to the output connections. I/P transducers will have an output range for you to choose from, and various input and output pressure connections. Included brackets allow you to easily mount the unit in-line or on a panel.